Gertrude "Trudy" Mary Austin, passed away peacefully on Sunday March 17, 2019 at the age of 88. Trudy was preceded in death by her husband of 47 years, Glenn Duffy Austin, her parents Paul Moseby and Mary Anne Akers, her brother Paul "Buddy" Akers, Jr., and her sister Ella Nora Akers. Trudy is survived by her loving son Gregory Austin, and her daughters Marcia Reid and Kimberly Austin. Trudy is lovingly remembered by her granddaughters Kerrie Bruce and Kristalle Peterson, her grandson Phil Weaver, and her 4 great-grandchildren and 1 great great-grandchild. Trudy was born in Bellville, Michigan on December 24, 1930. 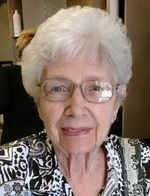 She graduated from Melvindale High School in 1949. Trudy was a homemaker and later on an executive secretary. Trudy was a lifelong volunteer, helping others through such organizations as Angel Flight, Friends of the Library and many others. Trudy was a resident of the Plantation at Leesburg for 25 years. Trudy was a member of The Church of Jesus Christ of Latter-Day Saints and one of her greatest loves was the work she did in the church nursery as well as genealogy projects and home visitation. Trudy enjoyed reading, playing golf, doing word search puzzles, was an active member of T.O.P.S., crafting, listening to music and playing with her beloved Kitten. Cremation will take place at Beyers Funeral Home in Leesburg, FL and a private inurnment will take place at the Florida National Cemetery in Bushnell, FL at a later date. In lieu of flowers it is the wish of the family that donations be made to Cornerstone Hospice at 2445 Lane Park Road, Tavares, FL 32778. The family wishes to extend their gratitude to all family and friends during this difficult journey. To send flowers to the family of Gertrude Mary Austin, please visit our Heartfelt Sympathies Store.